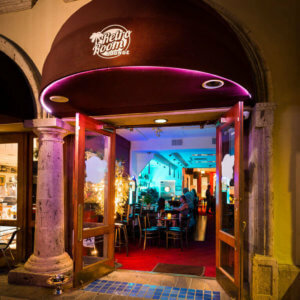 The RetroRoom Lounge is a gay bar in Palm Springs, but we are welcoming to all. We feature karaoke nightly in intimate and retro atmosphere. 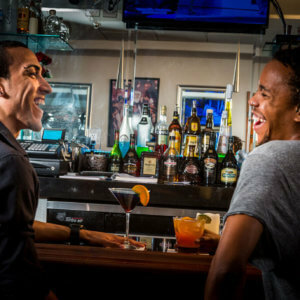 We have a full bar with featured specialty cocktails featured nightly. In a former life, the RetroRoom Lounge was Legends of Palm Springs which was a classic Palm Springs Bar until the adored owner and actor Gregg Robblee passed away in an untimely death. His photographs still line the walls. Many of the employees and customers believe the place is haunted by him to this day. Come see for yourself! The new owner is keeping the same vibe with a few fun changes. If you want to escape the crowds on Palm Canyon or Arenas we are just the place. We offer karaoke 7 nights a week with different hosts. Every Saturday we feature a drag show perfect for bachelorette parties. Also, you can’t beat our super happy hour prices every day til 7pm.